Our latest article takes an in-depth look at styles suitable for the five major face shapes. You will find tips and advice for making the most of what you've got For those of us who have some spare time to read an article or two. Keep up to date with all the hair, beauty, and fashion trends that are taking the world by storm, and if you've exhausted all the pictures in the galleries there are plenty more here. Marvel at the latest red carpet hairstyles. Significant stars of stage and screen often ignite the trends the rest of us eagerly follow. A devotee of what look and style everyone's wearing wouldn't consider anywhere but influential Hollywood? From JLaw's pixie to Natalie Portman's shaved head, find every celebrity hair trend you can think of, right at your fingertips. We have hand picked some of the best videos out there for each of our main categories. Maybe you're a visual learner, or you'd rather not sit there scrolling through endless written instructions. We're with you! We have tons of videos to teach you what's new in hair and fashion, and how to rock the most popular looks. There are slide shows, tutorials and in depth advice to guide or assist you. Everyone should test something out before they commit themselves so this make over tool is ideal. Don't take the plunge without trying before you buy. Give our free hairstyles makeover utility for size. Simply upload a photo of yourself or one of our models that resembles you the most and try on an unlimited number of styles or just simply browse for ideas. Then just print the result and take it to your salon. Short hairstyles are sleek and stylish. From a bob to a pixie cut, a short haircut can be a bold statement or a softer style, depending on how your choose to work it. Short hairstyles are generally easier to maintain – there is less to wash, colour and style – but they are by no means restrictive. A short hairstyle allows you to experiment with vibrant colours and dramatic cuts, meaning you can switch up your image at the drop of a hat. There are many things you can do with a medium haircut. As a generally youthful flattering length, there are a range of hairstyles you can try and looks you can achieve. Medium-length hairstyles are great for creating volume and for enjoying the best of both worlds when it comes to hair-up style or bouncy blow-drys. Long, luscious locks are the dream for many, and when cared for appropriately it is easy to see why hairstyles for long hair are so popular. Having long hair opens up your styling possibilities considerably, from flowing curls and waves to pretty plaits and braids. Long hairstyles are beautiful, but do require a level of maintenance. You can stay on top of your long hair care with our tried and tested tricks and tips. 1001-Hairstyles: Pictures of Haircuts & Hairstyles for Women and Men. 1001-Hairstyles.com has been a popular destination for those seeking inspirational pictures of haircut ideas for nearly 20 years. Now having well in excess of the original thousand plus one pictures, it’s a pioneer, one of the first sites of its kind. Constantly updated to stay as relevant today as when the internet was young. If you’re looking for a new lease of life, you’re in the right place. 1001-hairstyles.com surpasses even its name by having an almost unlimited collection of ideas and types for you to sort through and find the perfect design. Your leading resource for haircut inspiration and hairstyle ideas for women and men. Whether you’re looking to totally change your image or simply maintain your tresses, discover our wide collection of pictures of inverted bobs, all the other types of bob, pixies, updos, beehives, victory rolls, bridal and wedding styles and all the myriad of other hairstyles. Also, find a host of handy hints and tips to help you style to suit you perfectly. The Best Hairstyle For You. Use our Free Virtual Hairstyle Makeover Tool to instantly view what each new design would turn out like. Browse our Celebrity section to take inspiration from the hottest celebrity haircuts of the moment, and check out our Blog for the latest tips and trends. Give our Makeover Tool a try. 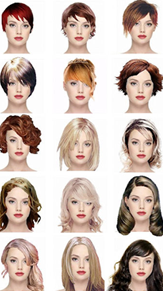 Visitors can take new hairstyles for a test drive, and customize any style to match any color or style preference. Come and see us regularly for new ideas, styling tips and more! You’ll find our handy makeover tool invaluable. The celebrity section is always worth a look as it contains hundreds of your favorite male and female celebrities on the red carpet in their posh frocks and perfect coiffures. Our celebrities show you the newest and brightest fashions from Tinseltown. Check out what’s going on in Hollywood, and of course, don’t forget to check in after any big awards night. Figure out what your favorite stars are wearing. Give our blog a visit to get the most recent news on haircuts for you to pick and choose from. Come back frequently and look through the blog to see what you missed out on and what you can learn. There are lots of tips, pictures, and ideas to browse through daily. For the things in life better seen in motion, we have the video collection. Check out our tips and tutorials. Handpicked by our team, they guide you to your destination effortlessly.